Retail Price: $69.00 Log in for LOWEST PRICE! We've featured a lot of wines since 1972, so we've told a lot of stories about a lot of people, wines, wineries and vineyards. This one is just about as fascinating as it gets. Sonja Magdevesi was visiting her family homeland in Macedonia, completing her fieldwork for her Masters in Journalism. Her father took her through the fields of neglected grapevines that her ancestors had worked, to show her what her lost heritage might have been. Later, back home in Malibu in 2002, she met actor Emilio Estevez, who coincidently was planting a vineyard and needed some help. It was just the push she needed. Though she loved journalism, she realized that it was winemaking that was in her blood - and there was no going back. In 2004, Sonja bought property in Santa Barbara County with the dream of making great wine from Rhone varietals - which she does, mostly from Grenache. But once introduced to Pinot Noir from Sta. Rita Hills, it was hard to not fold that into her arms as well. Our selection was sourced from Hayes Ranch, in the sun-drenched far western reaches of the Sta. Rita Hills. 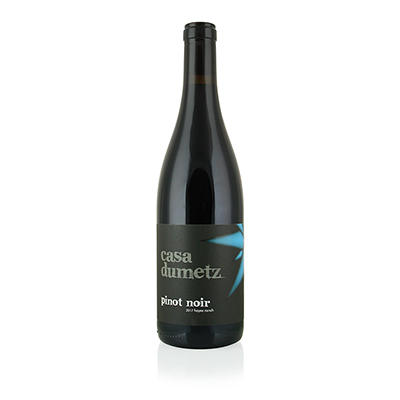 Beginning with this vintage, Casa Dumetz will now make only Pinot Noir. Well, how about that? In her first Pinot Noir since 2014, we can sense the beginning of excellent things to come. The delicacy and sensual nuance here are truly something to behold. It has all the power of the grape but also a delicate, feminine touch. Perfection!